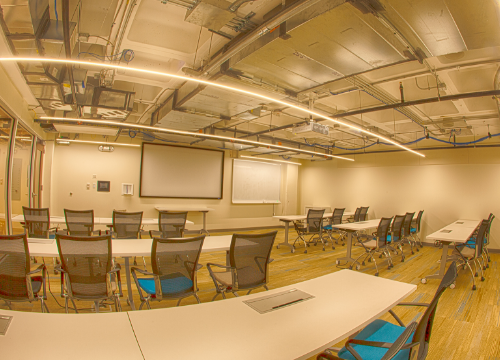 Room 38 is a standard training room located on the lower level. With 12 mobile tables and 24 rolling chairs, this room can adapt to almost any meeting format necessary. With a full glass wall looking out into the lower level lobby, your guests will appreciate the open feel of this room. Smart Kapp dry erase board with Bluetooth: Users will be able to connect their mobile devices to the board to view content that is drawn on the whiteboard and save content to their device. I want to change the layout of this room. How do I do that? All of the furniture in room 42 comes equipped with wheels and are completely mobile. You are welcome to change the layout of the room to whatever you need (feel free to ask for help). Just be sure to return it to its original layout! Our Center Animator will be available to assist you with any technology needs you may have before and during your event. This service is included in your reservation rental fee.